If they work fine for you, then there's probably no need to change them. The only thing that sticks out is that it looks like you're spawning two dzen panels, when it possible to do everything with one. The dzen one might look a little messy, but the example panel and panel_dzen scripts on the bspwm github show how it can be done. My scripts are just modified versions of those, and they work just fine. I use two dzen panels, because it was easier to do this temporarly this way. Also, it takes some time to get used to dwb after switching from firefox. Thanks for some directions. If I understand correctly I need to calculate number of spaces between tags and info. I'll try to make it work. It looks like I'll still need to run two scripts to update system info and tags separately. Please don't post support requests in Artwork and Screenshots; we have other forums devoted for that.
.:| gallery | github | libglyr | rmlint |:. Here we go, I have reached a better place from where I was when I last posted in the thread. 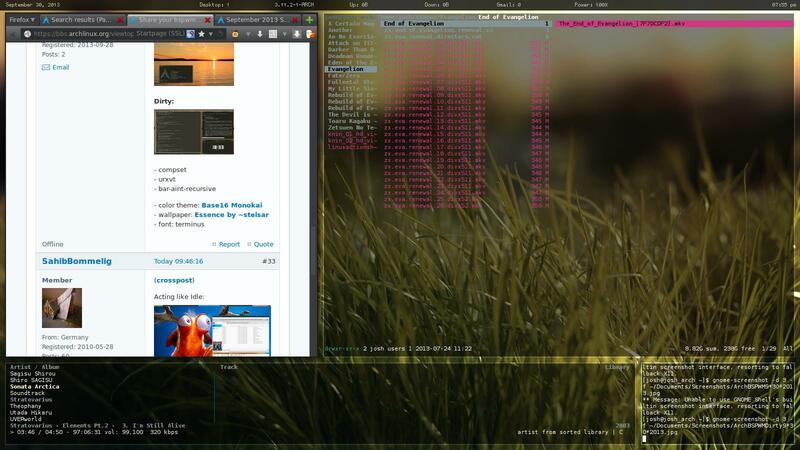 Using Sakura Terminal, Conky for Panel, with cmus and ranger. In what's looking to be a futile effort to get cleaner font rendering in my status bar, I gave xmobar a try. I'm not sure if the font really looks any better, but xmobar seems like a nice middle ground between bar and dzen2. It has the XFT support I'm looking for with proper text alignment, but a little more straightforward to configure to work with bspwm than dzen2. Thanks. It's numix-holo and the faenza icon set. Not bspwm related, but I'm curious: all those screenshots with those terminal-like tabs, is that possible with firefox/vimperator or are they all dwb? I've been using that feature a bit also, another reason to love bspwm. Might I ask what browser that is in the last screenshot. 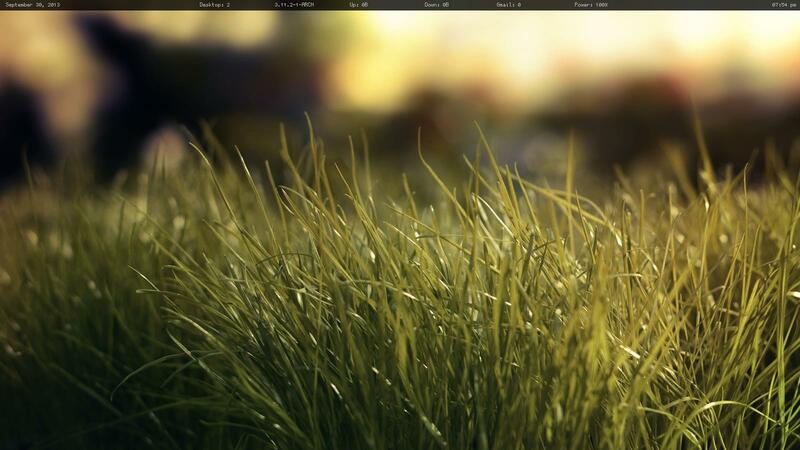 Loving your conky though, I may be inspired to do something similar now, as my current set up does not allow for me to see my cpu usage while in my panel because there is no room for it on the top, may do it on the bottom now. @earsplit, I am continually impressed by your setup. Though I am unsure of how you get by with staring at those color schemes They look nice as part of the whole, but they are just so dim! I would be interested in seeing your weechat configs though. My weechat looks absolutely nothing like that... yours is real purdy. I noticed that it hasn't made it into your dotfiles github repo though. The dark-black text is stuff I want out of the way, like the channels that haven't been updated since I last viewed them. 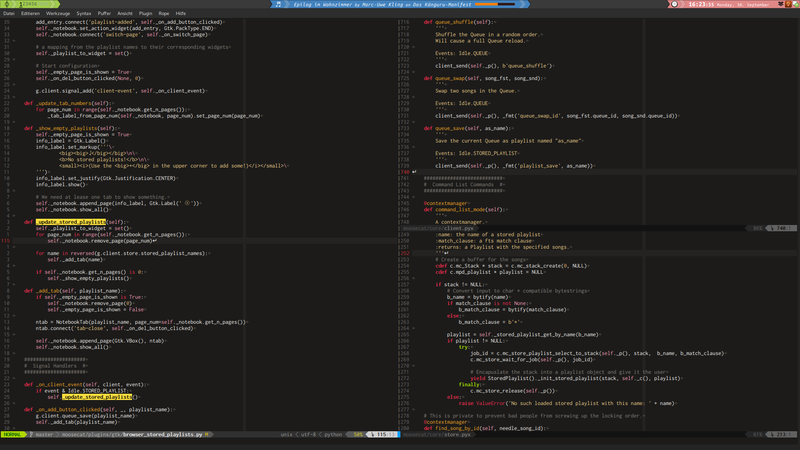 I actually find this colorscheme very readable at low-brightness (except of course for the dark-black). whats that bar? or rather, the systray?